They say it's lonely at the top. Why don't they ever talk about the fear? When you followed that old man up the mountain, you thought he would tell you the secret of success. You two walked for hours up that narrow path, the mist gathering around you. Every time you asked him if you were going to be there soon, he'd wordlessly motion you further on. The path got rockier while the landscape below you vanished in the fog below. But the old man had told you a good story so you were sure your hike was worth it. 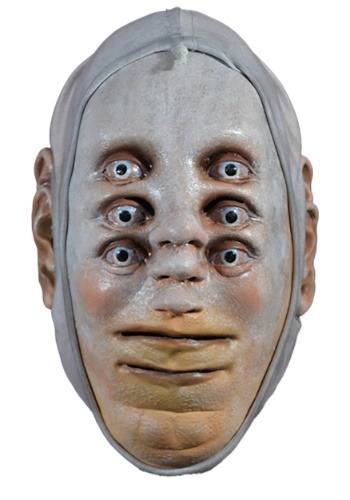 Any costume will benefit from this surreal mask. With a molded latex, holes for the eyes, nose, and mouth, you'll stay comfortable in this creepy look. Keep it secure with the handy elastic drawstrings that secure around your face and neck. The path ended and a tower loomed in the mist. The old man stopped by the ladder, smiled his toothless smile, and gestured for you to climb to the top. You did as you were told, climbing the freezing cold bars. You went this far, right? And when you finally reach the top platform you take in the dark and foggy view. You try and come up with something philosophical cause you must have come here for a reason. But when you turn around to head back down the ladder was gone. There was no way to get down. Hey, you got what you asked for. You wanted to live life at the top, right?